As I write this, powerful members of the Idaho House are doing everything they can to stall pro-gun bills. Rep. Karey Hanks — Republican-District 35 — is seeking to expand Constitutional Carry to all law-abiding citizens 21 and over. Rep. Hanks needs your immediate support and we’ll tell you how in just a second. As a reminder, Constitutional Carry was passed just last year. 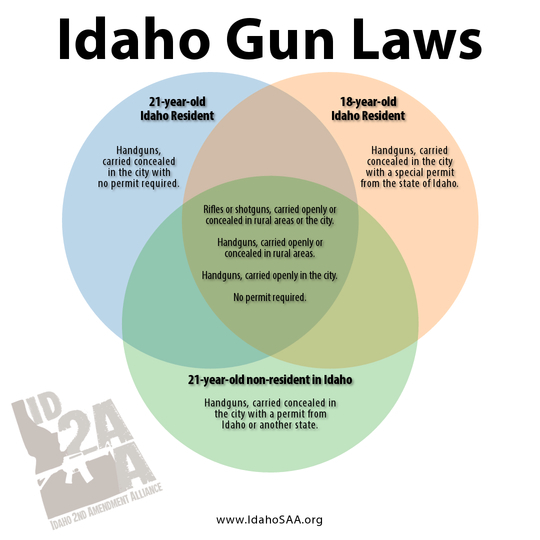 That means for Idaho citizens who are 21 and older, you can “bear” arms without permission from the government. However, instead of streamlining the law, and making it easier for citizens and law enforcement to understand, the Idaho legislature complicated the issue. You see, we are treating non-Idaho residents who are guests here, like 2nd class citizens. Non-residents can already carry their shotguns and rifles, concealed, anywhere in the state without a permit. They can also carry their handguns, concealed, anywhere outside city limits with no permit. Literally, the only thing that non-residents can’t do is carry a handgun, concealed, inside city limits without a permit! The image below may provide a better visual for you to understand the current web our law enforcement officers and citizens have to deal with. Rep. Hanks wants to change all that. But, as we mentioned before, powerful members in the House are trying to stop her. The Secret Gun Committee — and the gamut of excuses — is in no short supply. That’s why we need you to take immediate action to support Rep. Hanks! >>> First, we need you to call and email each member of the House State Affairs Committee and tell them you want Rep. Hanks proposal to have a hearing by the end of January. Tell them to urge Chairman Loertscher to have an immediate hearing on the proposal. That is your job! Take a few minutes of your day and call and email each of them. Be respectful but firm. >>> Once you have emailed and called the committee members, be sure to sign the petition to remove the residency requirement for Constitutional Carry! Stand and fight with us and with Rep. Hanks and together we can make this happen!